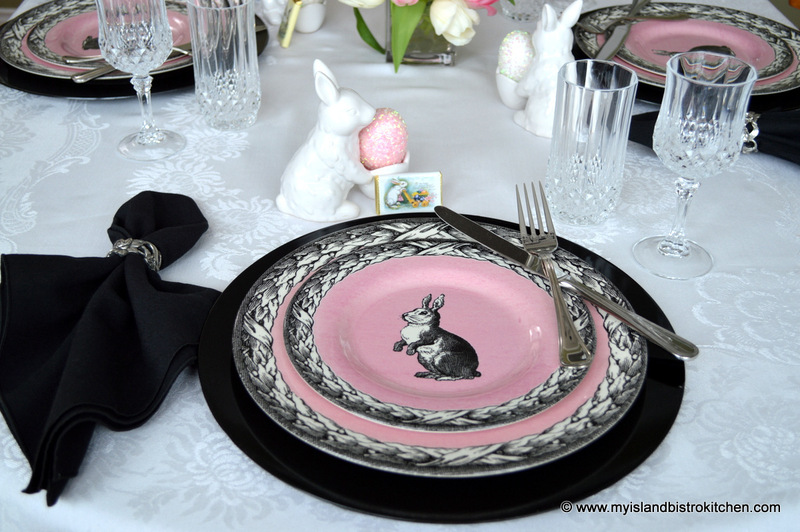 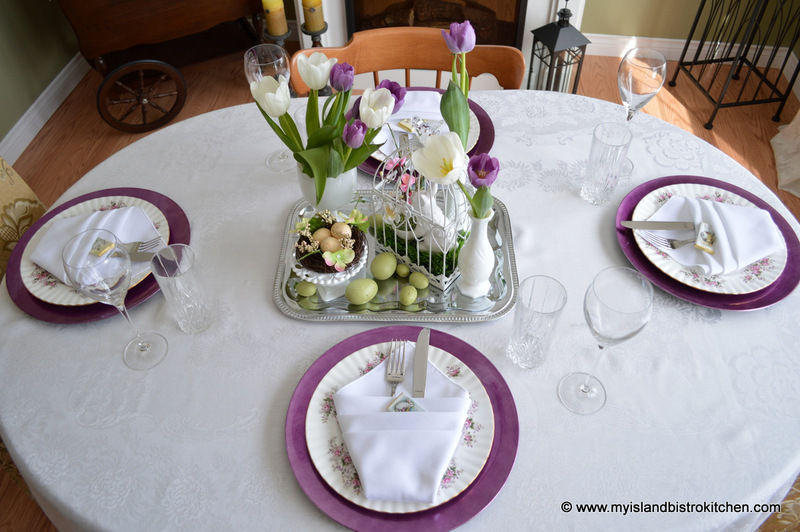 My color scheme for my Easter dinner table is purple and white. 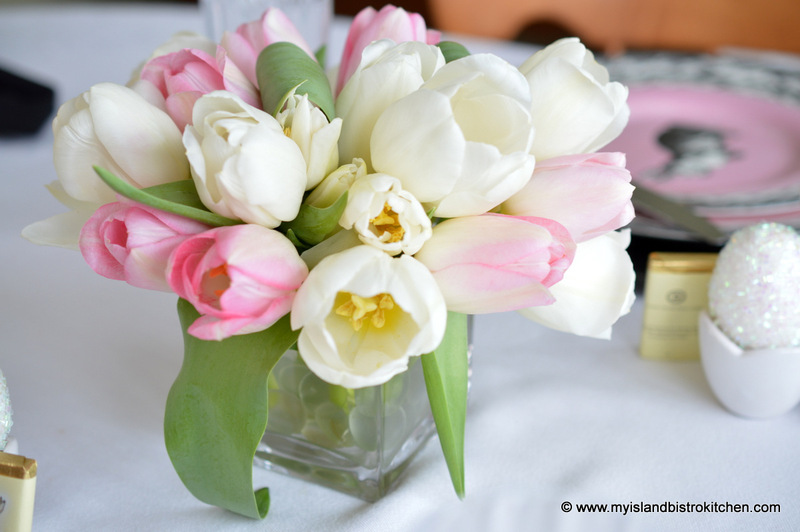 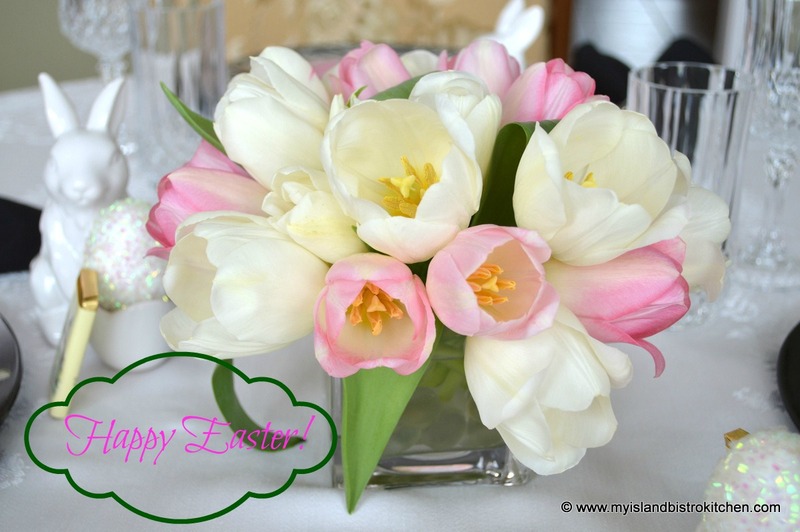 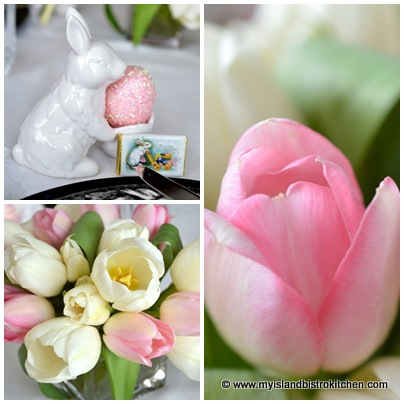 Of course, I am featuring the lovely spring tulips from the greenhouses of Vanco Farms in Mount Albion, PEI. 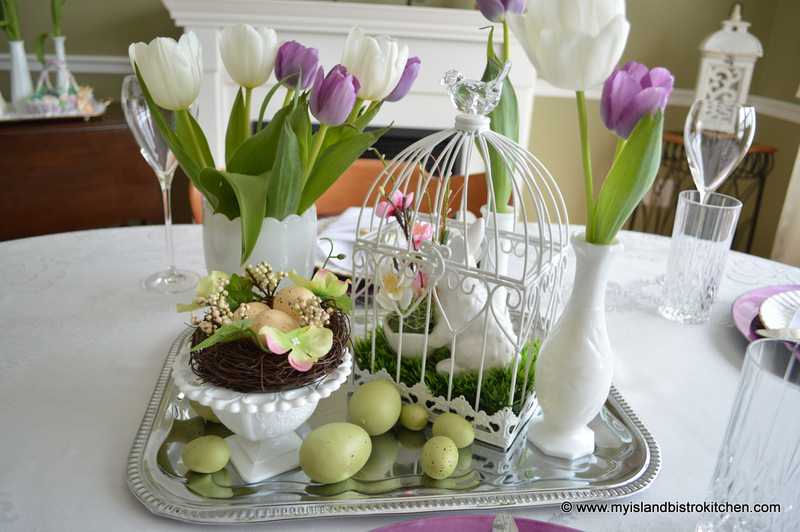 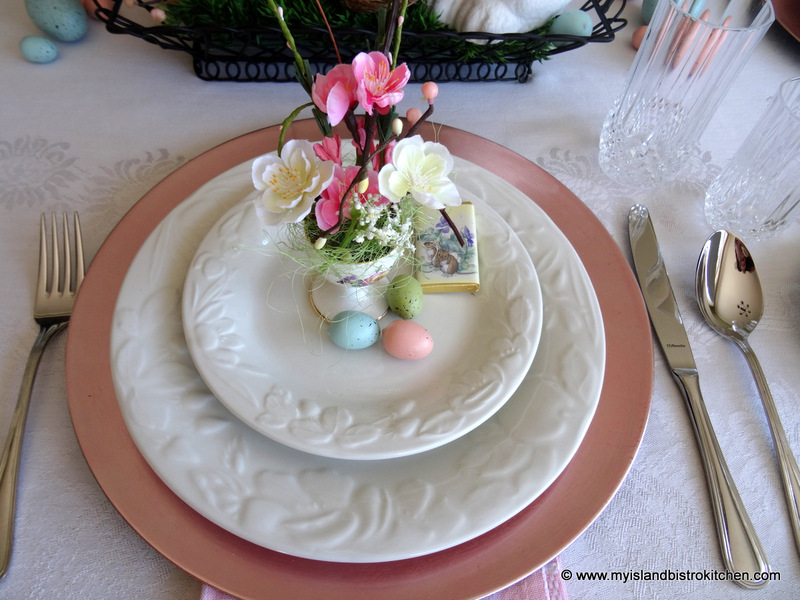 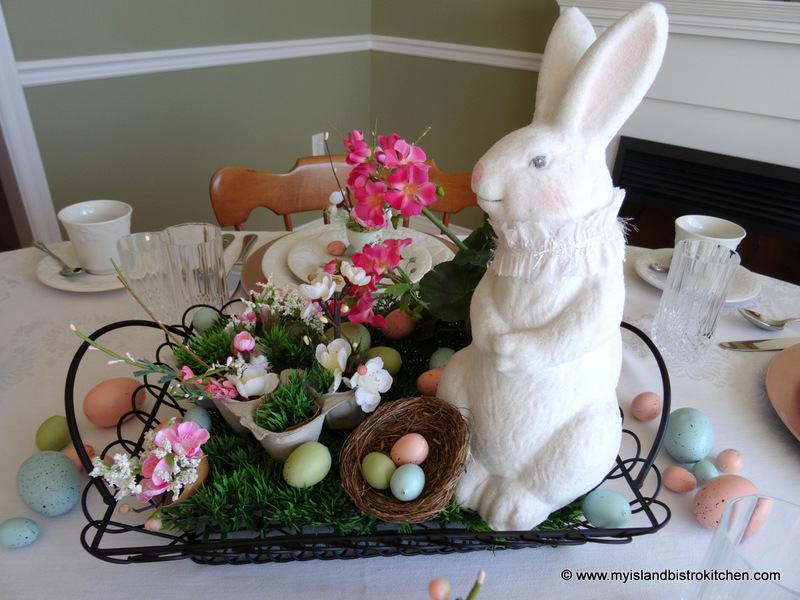 Lately, I have been using trays and baskets to “corral” the elements of my table centerpieces. 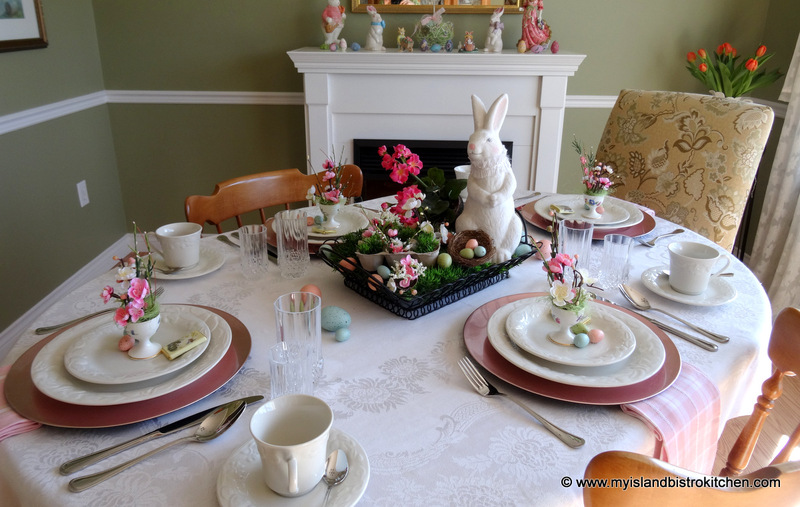 I find this is an easy way to display a number of items in a centerpiece and it keeps them clustered as, otherwise, they sometimes spread aimlessly across the table without focus. 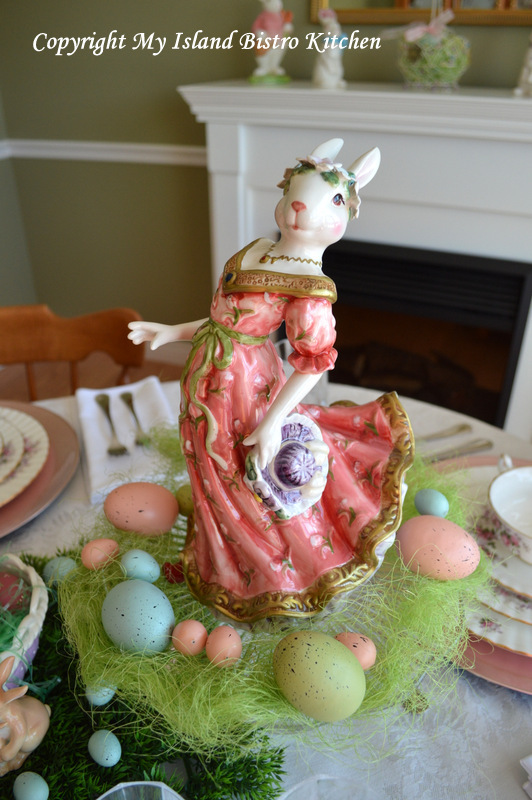 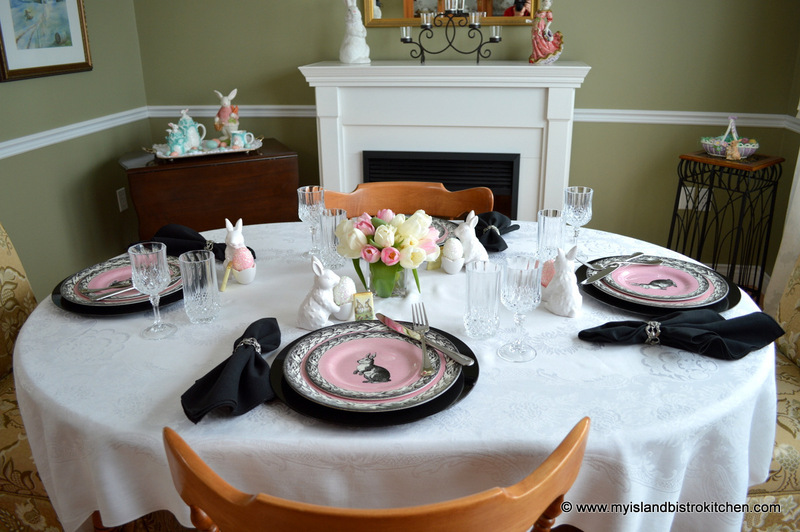 Today, I have used several pieces from my milk glass collection and added a small wire cage into which I have placed a bunny. 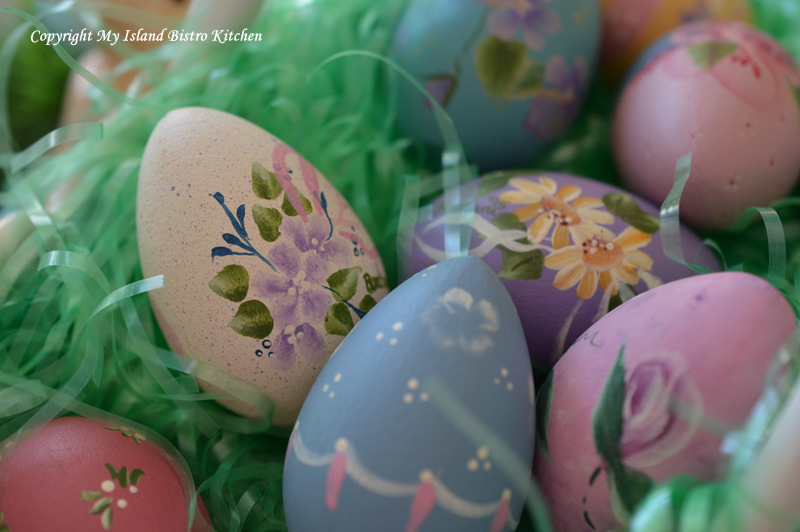 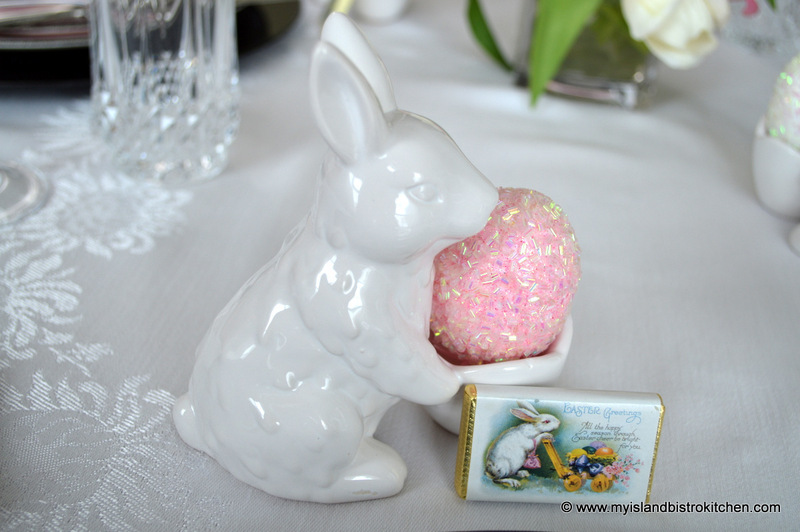 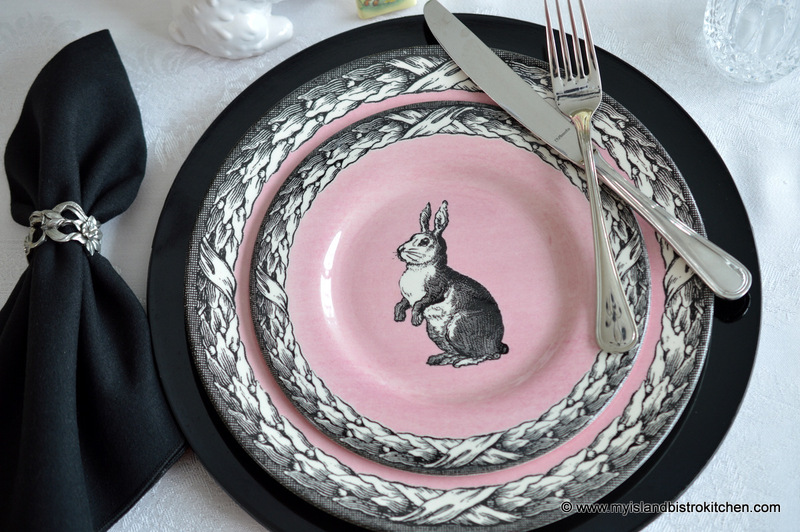 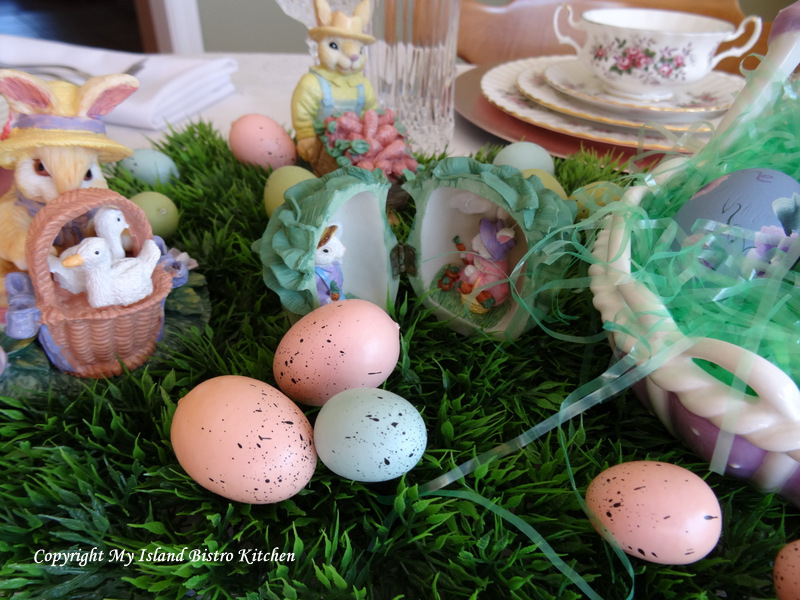 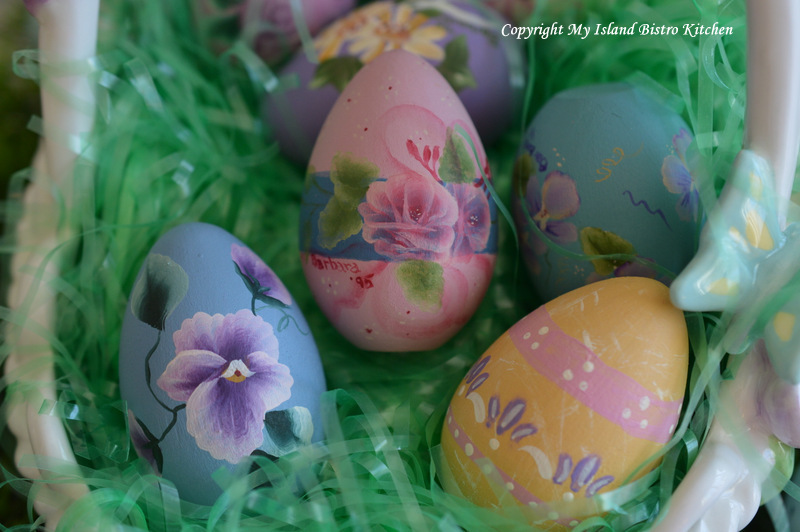 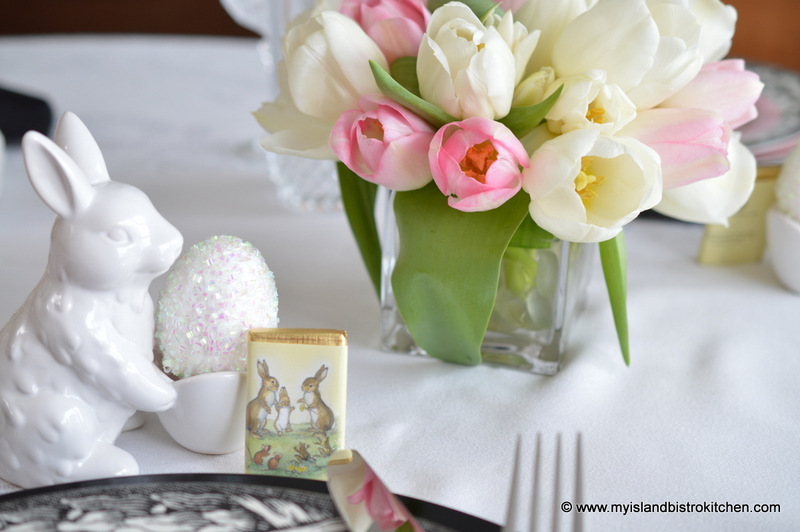 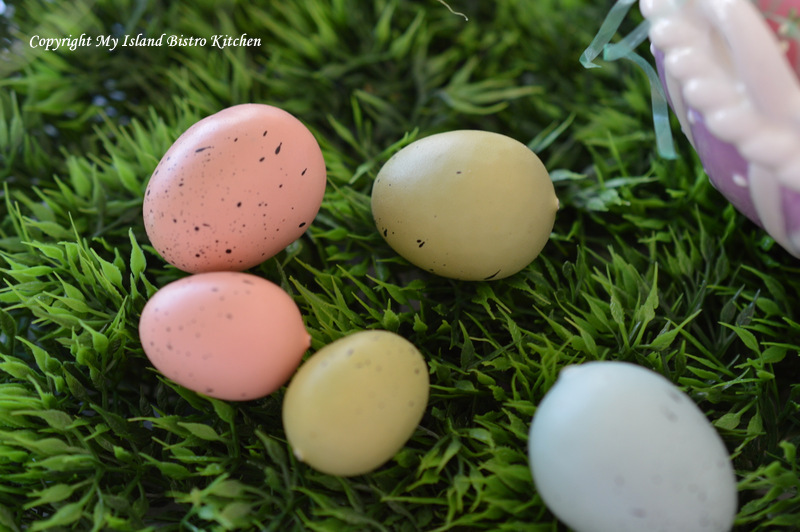 Faux Easter eggs are a great filler to add interest to the tray. 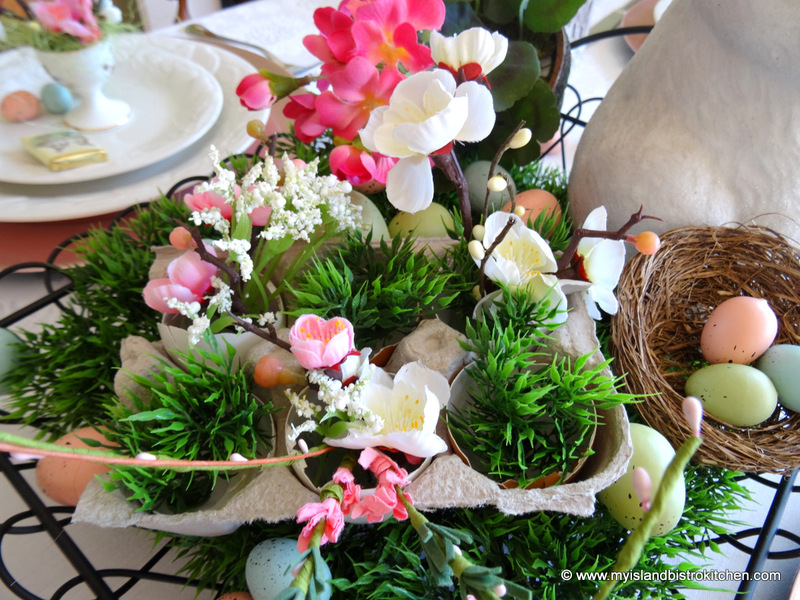 We often think that a bouquet of flowers in its entirety needs to be all in one container. 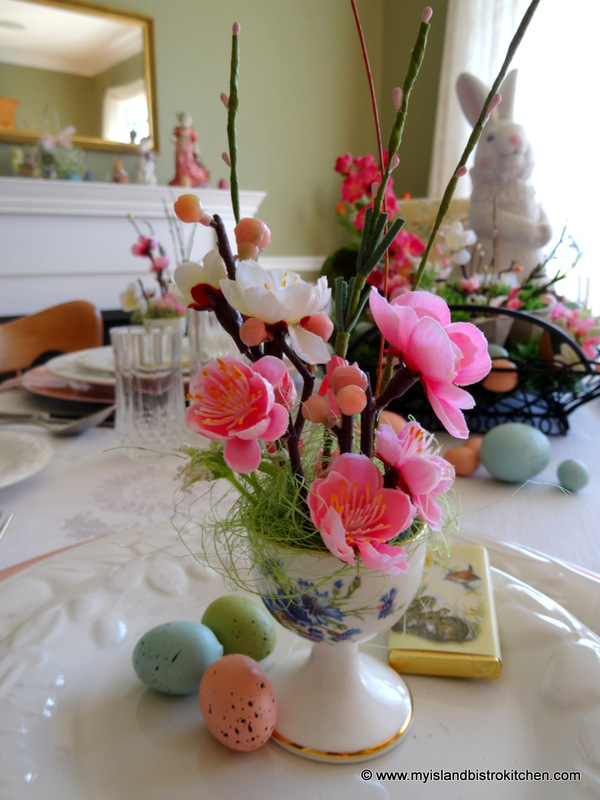 However, a much more interesting collection, or vignette as I have done here, can be created if the flowers are distributed between several vessels and at different heights. 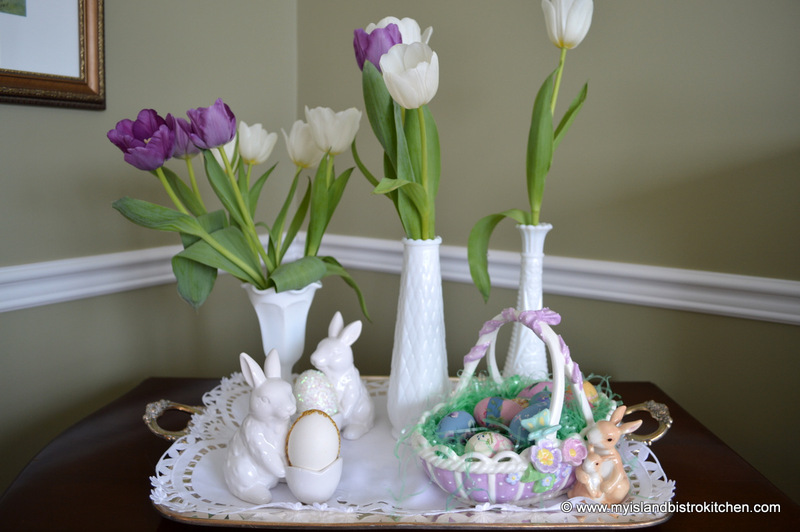 One of my favorite pieces of milk glass is the little bowl shown in the photograph below. 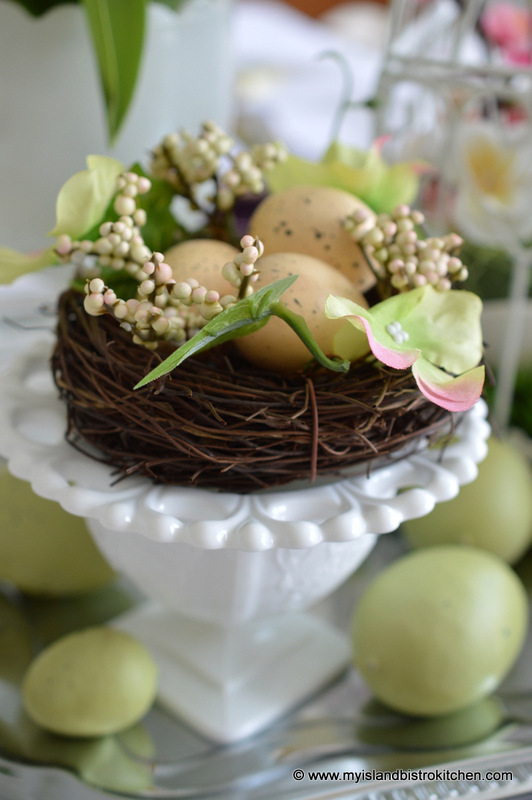 It’s the perfect size to hold a small bird’s nest. 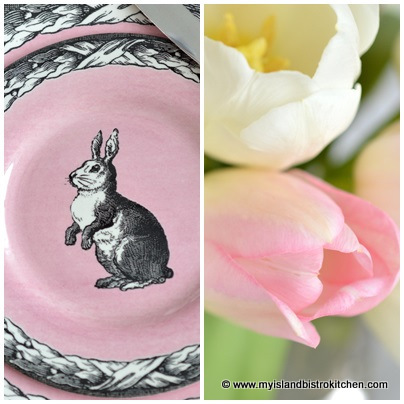 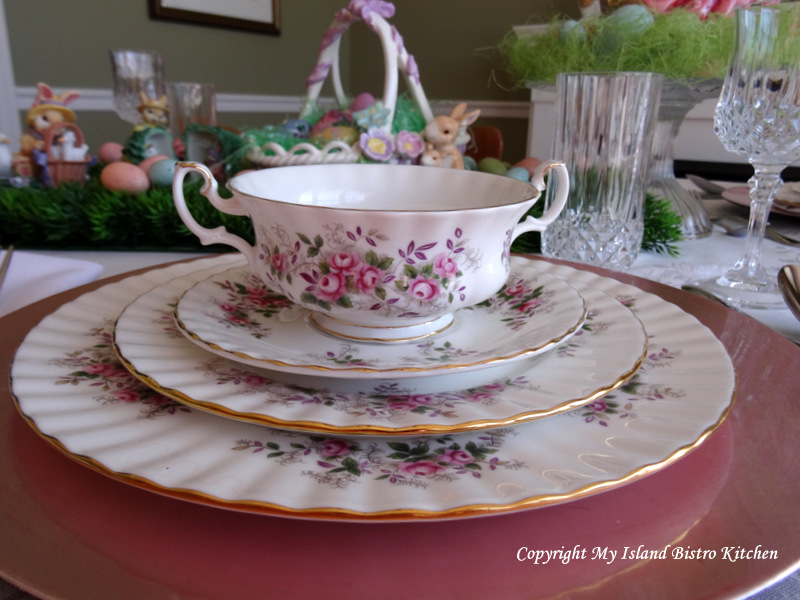 I have also chosen to carry the milk glass and tulip theme over to the tea cart where I have created another spring vignette in the corner of the dining room. 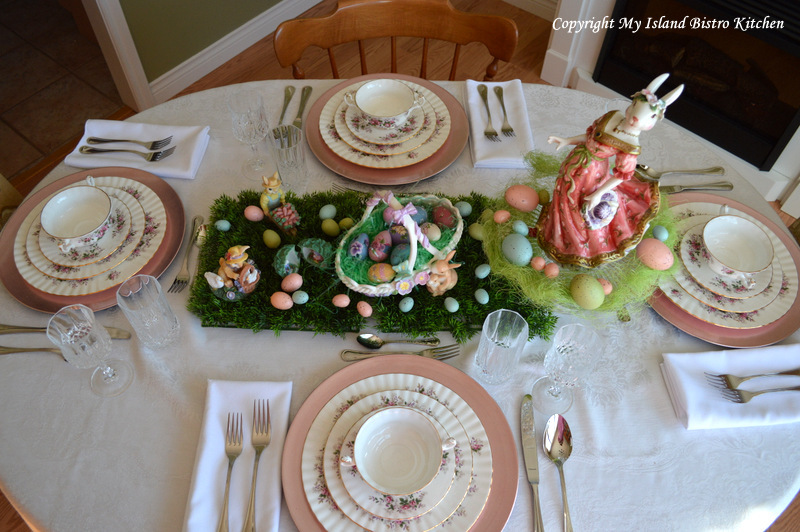 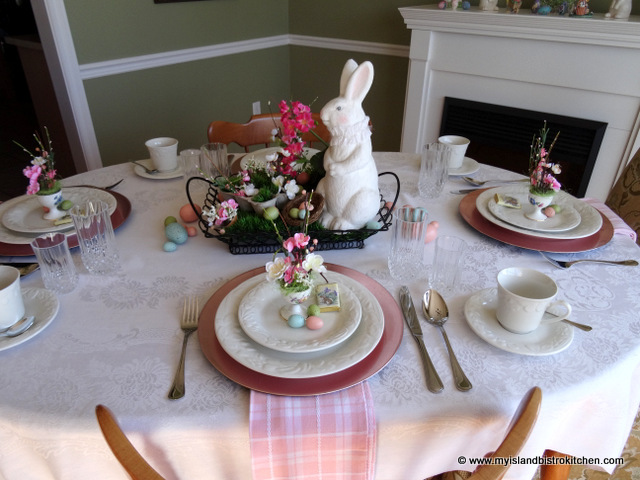 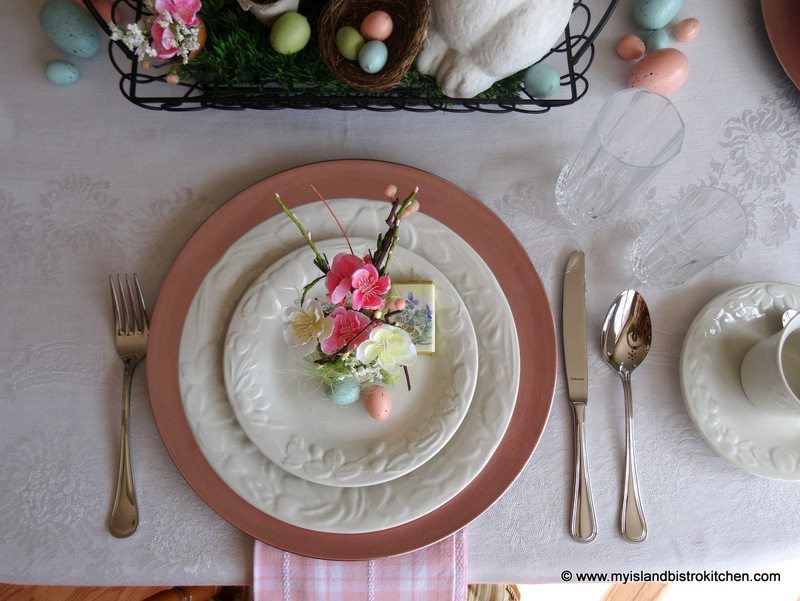 The napkin fold I have chosen is the Easter basket fold. 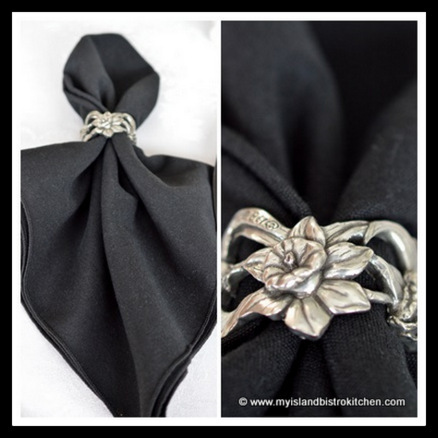 This is a simple fold to do and I have used it to hold the cutlery and, what would an Easter basket be without a little chocolate tucked inside! 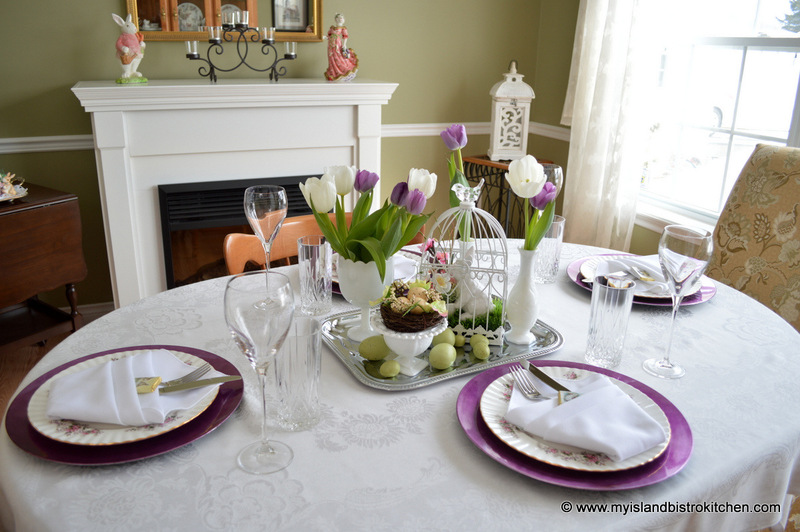 Because the centerpiece vignette has several elements to it, I wanted to keep each placesetting as simple and uncluttered as possible. 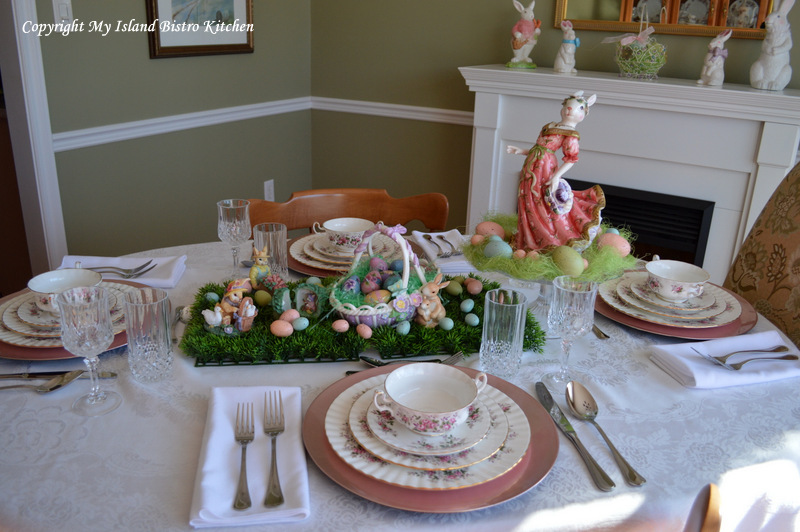 This allows the focus to be maintained on the vignette centerpiece. 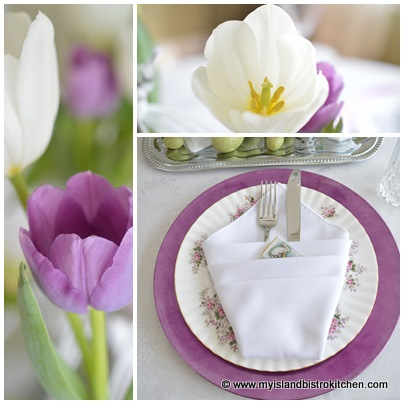 I have used purple charger plates to frame each dinner plate and these coordinate perfectly with the purple tulips. 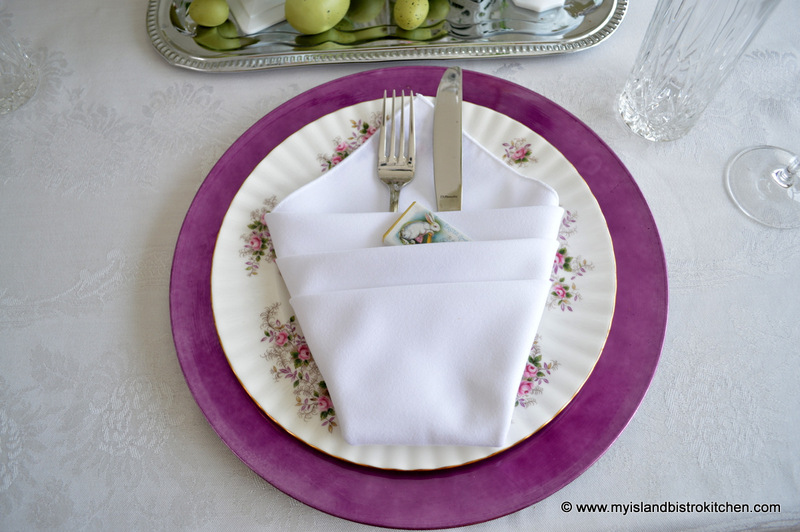 I can easily change up the look of my Royal Albert “Lavender Rose” china by the use of different colored charger plates. 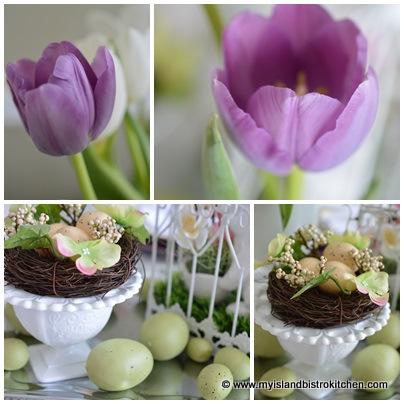 Purple is my favorite color so it’s an easy choice for me to work with this color scheme! 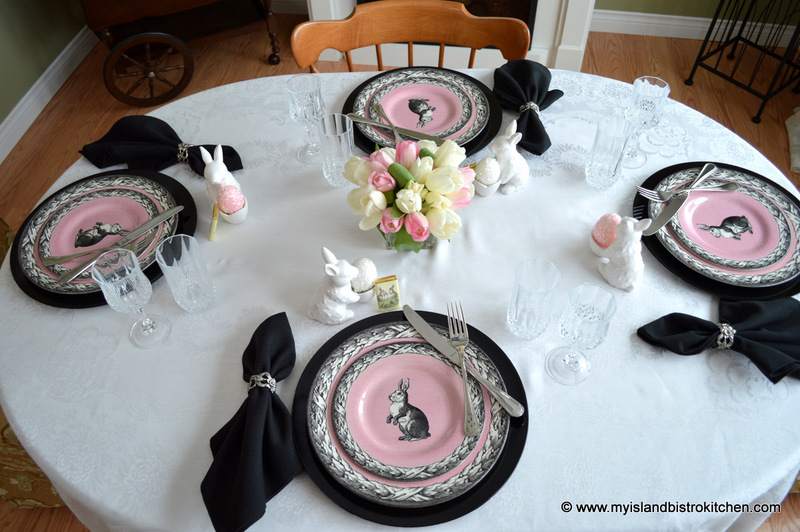 An added advantage of a “corralled” centerpiece is that it can easily be lifted off the table and replaced with a meat platter, for example, if you choose to carve the turkey or ham at the table. 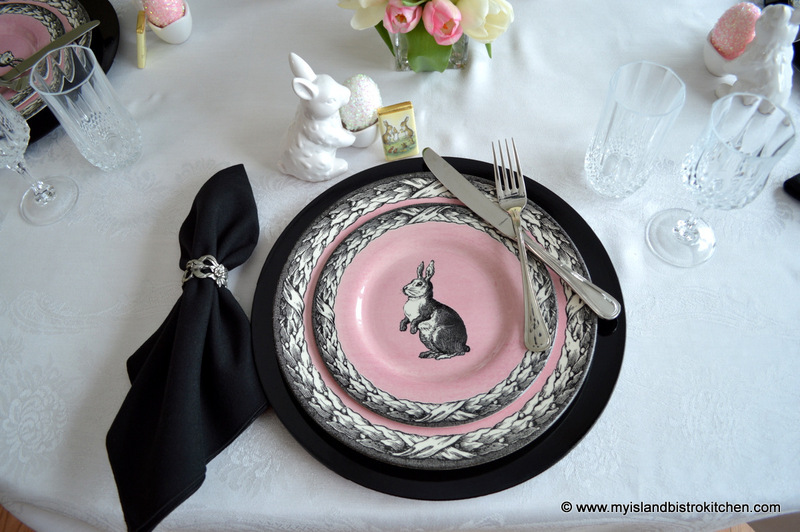 This way, your guests always see a centerpiece of some sort on the table throughout the entire meal, whether it be whatever was on the tray or the meat platter. 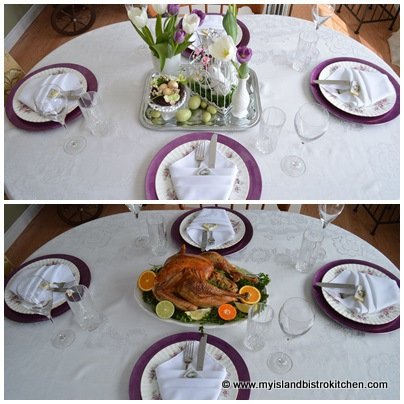 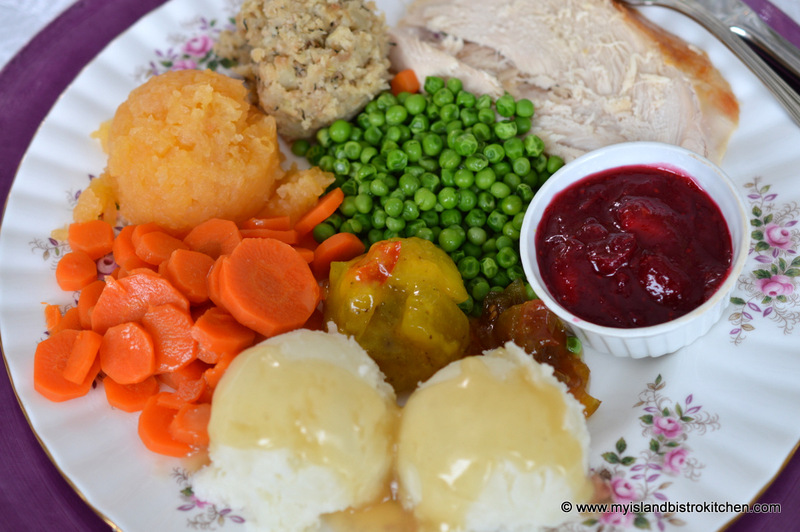 The photograph below shows the table centerpiece when the guests arrive which is then removed and replaced with the turkey platter for the main course. 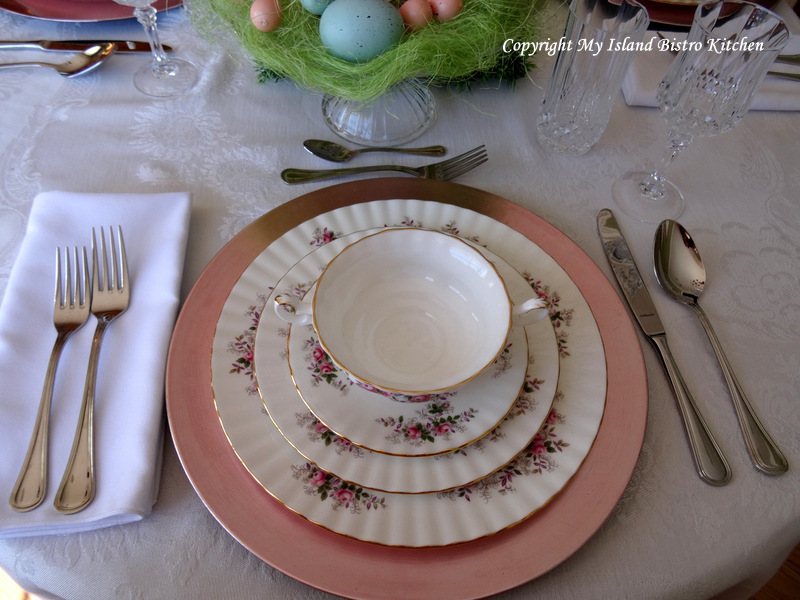 The vignette tray is then easily returned to the table for the dessert course. 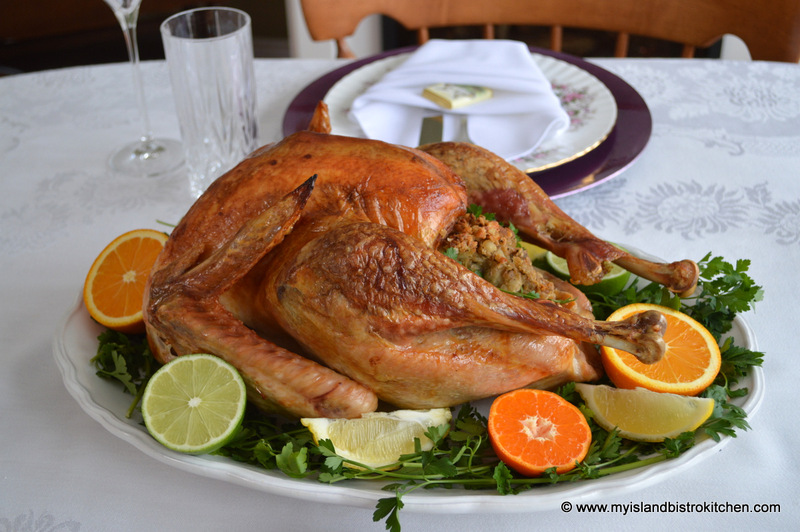 So, on the menu at my house for Easter Dinner is the traditional turkey dinner with all the trimmings, one of my all-time favorite meals.